As I was filming a Great Blue Heron, and standing as still as a tree, the beautiful Rusty Blackbird flew on the scene, not four feet away! My heart skipped a beat and I quickly turned my camera on the little blackbird. It’s foraging habit of flipping leaves to uncover insects and plant matter was fascinating and my only wish was that he stayed longer than a brief minute. Scientists only relatively recently became aware of the dramatic decline of the Rusty Blackbird. Reports show that the population of the RB has plummeted between 80 and 99 percent. 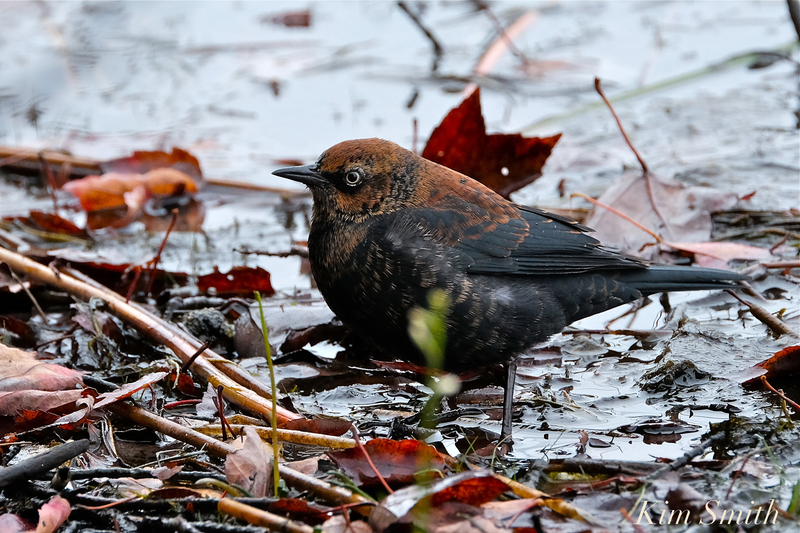 As is the case with so many creatures the whole earth wide, two of the greatest threats facing the Rusty Blackbird are loss of habitat and climate change. The birds are elusive, nesting in remote areas of the great northern boreal forest and wintering over in the wet woodlands of the southeastern United States. Over 80 percent of their winter habitat in the southeast has been lost to development. Changes in the ecosystem of the boreal forests has affected nesting and foraging. Without doubt, global climate change is the greatest challenge of our day. All living life as we know it is at risk. Millions of human lives have been directly impacted by the Earth’s warming temperature. We are at risk of losing thousands of species of flora and wild creatures. In the current political climate, restrictions on drilling and mining are being dramatically loosened in ecologically sensitive areas, not only creating a greater carbon footprint, but irreparably harming wildlife. Politicians are gutting the Endangered Species Act and the Migratory Bird Treaty Act of 1918. Is your candidate, in more than only words, willing to take a strong stand to address the environmental crisis and wildlife conservation issues? Does your political party fully support renewable energy initiatives such as wind and solar? Or are they ramping up coal, gas, and oil production. The Monarch Butterfly, Piping Plover, and the Rusty Blackbird are bellwether species that we can see in our own “backyards,” and they are sounding the clarion call loud and clear. Can you imagine Planet Earth without extraordinary and fascinating creatures such as this–and the world of beauty they provide? This entry was posted in Birds, Birds of New England, Cape Ann Wildlife, Eastern Point, Life at the Edge of the Sea and tagged Beautiful Birds of Cape Ann, birds of Massachusettts, Cape Ann, endangered species, Euphagus carolinus, male Rusty Blackbird, Rusty Blackbird, Rusty Blackbird Gloucester Massachusetts, wildlife conservation on October 28, 2018 by Kim Smith.